If CCSC didn't exist, each of our 41 member churches would have been expected to help 1,600 Houstonians last year with food, basic needs, employment services, connections to other community resources, and/or the seasonal needs of children. Each church working alone would be inefficient, especially considering how many of the churches are located near each other. CCSC's purpose is to be the local outreach office on behalf of each church, minimizing the duplication of services and creating a more efficient delivery system. As we begin 2015, it's good to remember our purpose. 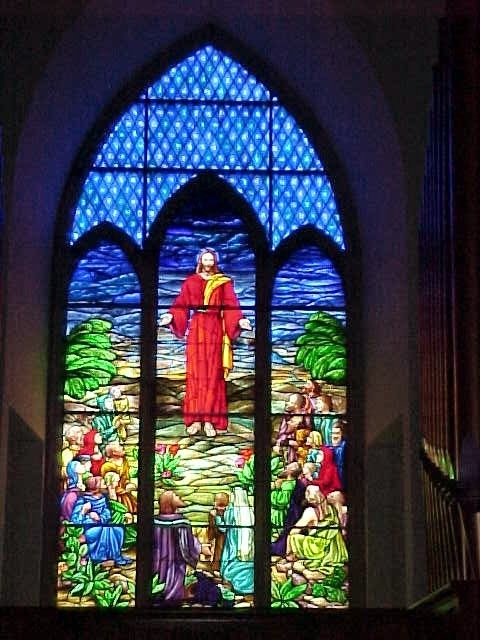 The picture below is of the stained glass in Bethany Christian Church. I'm sure it reflects a particular verse of scripture, but whenever I see a picture of Jesus with his hands open, I think he's telling us we should also have our hands open, ready to serve. Do you? CCSC's JobNet Manager sent out her program's newly-completed 2014 statistics this morning. She began her email with a statement about the quality of work done, noting the many individual lives this program positively impacted. She then shared a few client stories followed by a dashboard view of the statistics. I love that our staff meticulously tracks and maintains program statistics (which are a valuable tool) while staying focused on the people behind the numbers. We value a balanced view of quantitative information coupled with qualitative, non-measurable data. It's like using both the left and right sides of your brain. If you know anyone who is struggling in their job search, have them call JobNet at 713-626-8320. We'd love to help.